Given all the time and energy I have spent on finding the appropriate nourishment for my infant son (see previous posts: Judgments-Breastfeeding vs. Formula Feeding and Infant Formula Roulette), you know I did my research when it comes to additional nutritional supplementation. After a fair bit of trial and error, I’ve found the supplement cocktail that has been working best for our little one. Vitamin D: This fat-soluble vitamin can be ingested via food (think fatty dairy products or oily fish) or synthesized via sunlight exposure. It aids with calcium absorption and regulates calcium and phosphate in the blood to encourage normal bone growth. Vitamin D deficiency can result in rickets, a childhood bone deformity disease. Breastmilk unfortunately does not contain a high amount of Vitamin D – as such, the American Academy of Pediatrics (AAP) recommended in 2008 that breastfeeding women supplement their infants with 400 IU of Vitamin D per day. Formula-fed infants typically receive a higher amount of Vitamin D through their formula; however it may still not reach the recommended daily amount of 400 IU/day. What I did was simply figure out how much my son was ingesting via his formula based on volume, and then supplemented the rest using Enfamil V-Di-Sol (I found it at most of my local drugstores). One dropper of Enfamil’s product is about 400 IU of Vitamin D, so I would measure out a portion of that accordingly and add it to one of his bottles. He tolerated it well, and I continued with it until he was ingesting enough formula (about 28-32 oz/day) to reach the recommended amount using that alone. One note, however, is that there appears to be some dispute as to what amount of Vitamin D is the “right” amount for an infant. Potential toxicity is a valid concern as the amount reaches 1,000 IU per day, so stay well below that amount and always consult with your doctor before adding any supplements to your baby’s diet. Vitamin C. We all know about Vitamin C… In fact, I loaded up just this morning to hopefully nip the scratchy throat coming on in the bud. Found in many common fruits and vegetables (oranges, broccoli, strawberries, tomatoes, etc), the vitamin helps with immunity. 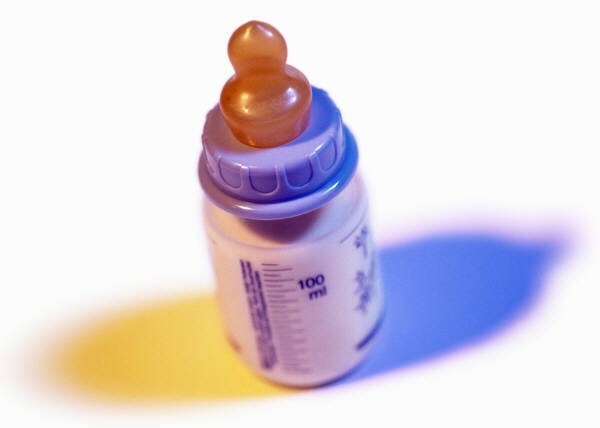 The good news is that both breast milk and formula should easily provide the adequate amount needed for infants. So why supplement? In truth, you don’t need to. I choose to supplement before and after vaccinations only, to help with my son’s immune response. So, about 3-5 days before and 3-5 days after each set of vaccinations, I supplement him with 1/2 teaspoon (50 mg) or less of Country Life Maxi Baby C Liquid in one of his bottles. Just enough to hopefully give him that boost to get him over the vaccine hump. The recommended daily amount of Vitamin C is 40 mg/day for infants up to 6 months, and while an upper tolerable limit is not established for infants, it is established for children ages 1-3 years at 400 mg/day. Of course, as his daily formula intake increases, his Vitamin C supplement before/after vaccinations decreases; although the vitamin is typically well tolerated up to daily limits. Probiotics. LOVE. THIS. STUFF. I was so worried about my son’s immunity due to him not being breastfed that I looked into all kinds of supplements to potentially help in this area: bovine colostrum, raw milk, probiotics, etc. It was an easy decision to go with probiotics. Proven and safe, even my conservative pediatrician agreed that they “can’t hurt, and might help.” I will say, since using them, that our son has had no more colds, has a better appetite, and has the wonderful regular bowel movements that all new parents pray for. So what are probiotics? Basically, strains of good bacteria to help maintain beneficial gut flora; in other words, to help with the proliferation of good immune-strengthening bacteria in the gut. I tried a few different formulations before finally finding one that stuck. I knew there were several bifidobactera (B) and Lactobacillus (L) strains that I wanted included: B. infantis, B. breve, B. longum, L. acidophilus, and L. rhamnosus. I also wanted Fructooligosaccharides (FOS) included, which is actually a prebiotic that supports the growth of bifidobacteria in the gut. The hardest part was finding a product that included both the bacterial strains I wanted AND FOS, but I finally found it in Nature’s Way Primadophilus Children (and btw, I could only find it at Sprouts). It comes in a powdered form that needs to remain refrigerated, and I add 1/2 teaspoon to one bottle daily. As I said, it’s worked wonders for our son and I only wish we started him on it sooner. So there you have it – the three supplements that have worked best for our baby. I would love to hear about what is working well for others… Any other recommendations?